The Game View is rendered from the Camera(s) in your game. It is representative of your final, published game. 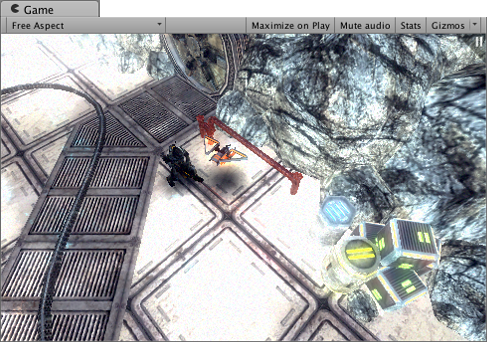 You will need to use one or more Cameras to control what the player actually sees when they are playing your game. For more information about Cameras, please view the Camera Component page. Use the buttons in the Toolbar to control the Editor Play Mode and see how your published game will play. While in Play mode, any changes you make are temporary, and will be reset when you exit Play mode. The Editor UI will darken to remind you of this. Scale 슬라이더 This allows you to zoom in and examine areas of the game screen in more detail, or zoom out to see the entire screen where the device resolution is higher than the Game View window size. You can also use the scroll wheel and middle mouse button to do this while the game is stopped or paused. Maximize on Play Enable this to make the Game View maximize itself to 100% of your Editor Window for a full-screen preview when you enter Play Mode. Stats 게임의 오디오 및 그래픽스에 대한 렌더링 통계를 확인할 수 있는 통계 오버레이를 표시하려면 이 옵션을 클릭합니다. 이 옵션은 플레이 모드에서 게임의 성능을 모니터링하는 데 아주 유용합니다. Next to each Component’s name are the settings for the icon and gizmos associated with it. The Icon setting reveals another popup menu which lets you choose from a selection of preset icons or a custom icon defined by a texture. The Gizmo setting enables you to selectively disable Gizmo drawing for specific components. The 3D Gizmos setting at the top of the menu refers to the Gizmo icons. With the setting enabled, the icons will show the perspective of the camera (ie, icons for nearby objects will be larger than those for distant objects), otherwise they will be the same size regardless of distance. The slider next to the checkbox allows you to vary the size of the icons, which can be useful for reducing clutter when there are a lot of gizmos visible.